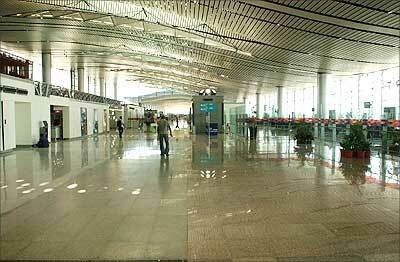 The swanky Rajiv Gandhi International Airport at Shamshabad, about 30 km from the heart of Hyderabad, has been constructed by GMR Hyderabad International Airport Ltd, a public-private joint venture between GMR Group, Malaysia Airports Holdings Berhad, the Andhra Pradesh government, and the Airports Authority of India. GMR Group holds 63% of the equity, MAHB 11%, while the Andhra Pradesh government, and Airports Authority of India each hold 13%. The Rs 2,470 crore (Rs 24.70 billion) airport is spread over 5,400 acre of land and has the second longest runway in India. The 76-year-old Begumpet airport has now been shut down. The 75-metre high air traffic control tower at the airport is also the tallest in India. A 105,300 sq mt terminal has the capacity to handle 12 million passengers per annum. The terminal building has 12 contact and 30 remote stands for aircraft parking. The ultimate master plan is to cater over 40 million passengers per annum.